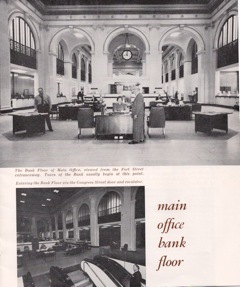 Manufacturers Bank, during the period of August 1933 until June 1992 had three Main Office buildings. 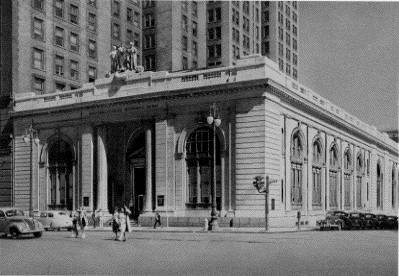 The first Main Office, opened August 10, 1933 was located in offices in the Penobscot Building. In 1943 the bank purchased an unoccupied building from Peoples State Bank which was located at the corner of Fort and Shelby. After considerable renovation, the new Main Office, referred to by most of us as 151 Fort was opened on January 3, 1944. 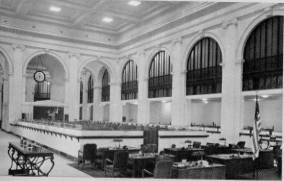 During the remodeling the bank removed 110,000 pounds of metal which was made available to the war effort. 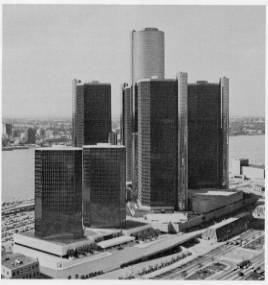 In 1977 the bank moved its Main Office to the Manufacturers Bank Tower in the newly completed Renaissance Center. 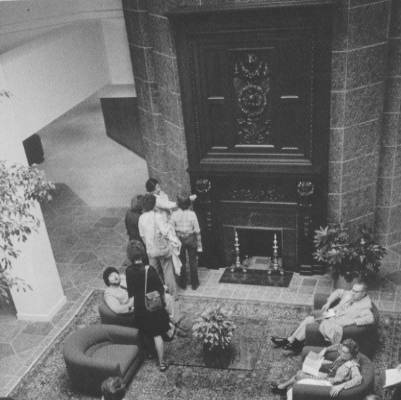 The ornate mahogany fireplace from the boardroom at 151 Fort Street was moved to the Executive Offices in the Manufacturers Bank Tower. This fireplace was the focal point of the reception area on the 38th floor. Executive Offices occupied the 39th floor. The first President of Manufacturers Bank was John Ballantyne. He was succeeded, following his death, in 1937 by Henry H. Sanger. In 1943 Charles A. Kanter became President, and Mr. Sanger was elected Chairman of the Board. In January 1948 Mr. Sanger retired, and Charles A. Kanter became Chairman, and William A. Mayberry became President. In 1955 Manufacturers Bank and Industrial National Bank completed a merger. In January 1957, when Mr. Kanter retired, William A. Mayberry became Chairman, and Arthur J. Fushman was elected President.. In 1963 Arthur J. Fushman became Chairman of the Board, and Roland A. Mewhort was elected President. In 1968 Mr. Mayberry retired and Roland A. Mewhort became Chairman. In 1969 Dean Richardson was elected President. In 1973 Rod Mewhort retired and Dean Richardson became Chairman of the Board. Louis G. Allen became President and Kenneth Aird was appointed Vice Chairman. As the bank approached its 50th anniversary year, another change in leadership occurred. In July, 1982 Gerald V. MacDonald was named Bank President. Louis G. Allen was named deputy Chairman of the Bank, Norbert A. Sylvester, vice Chairman, was named chairman of the Executive Committee, and Michael T. Monahan was appointed vice chairman. In 1990, when Mr. Richardson retired, Gerald V. MacDonald became Chairman, and Michael T. Monahan became President. 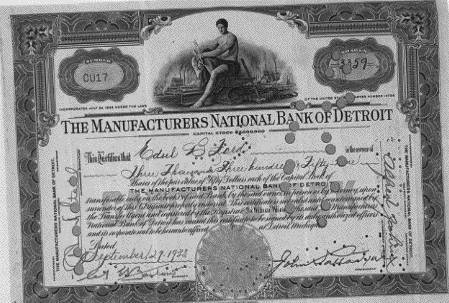 This is one of the early Stock Certificates issued to Edsel B. Ford, one of the founders.